Craving Roman style food? 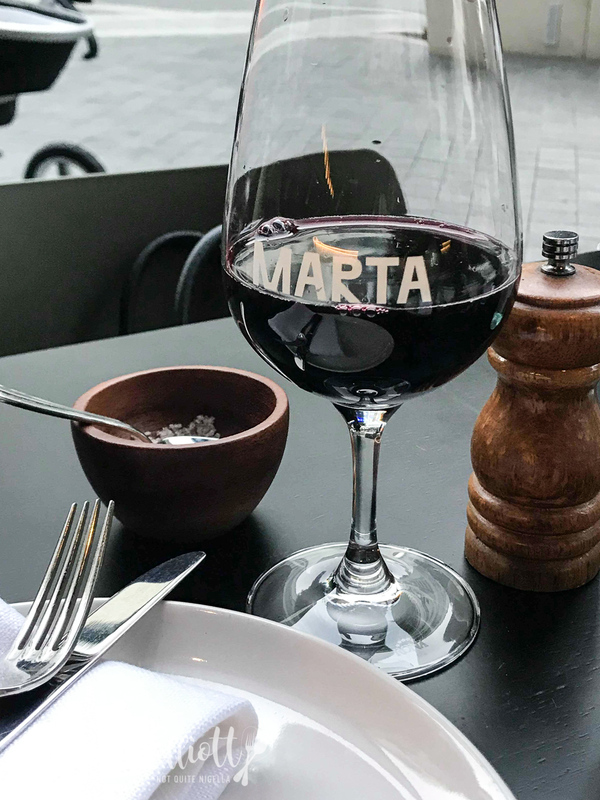 Marta is a new restaurant in Rushcutters Bay in the style of a Roman osteria (eatery with wine and simple food). 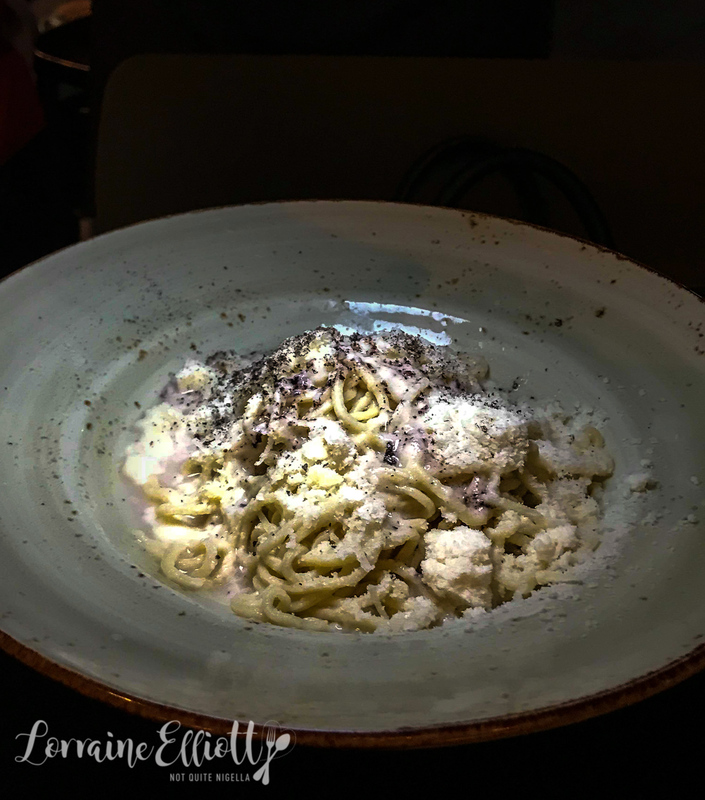 There are the Roman classics like tonnarelli with cacio e pepe (pecorino and black pepper) as well as a range of Schiacciate breads and Roman desserts. Marta was the perfect spot to catch up with my Galentine Kristie the day before Valentines Day. As a super fit gal, she was looking forward to catching up over carbs while I was excited to have Roman style food again. I have also forgotten my camera so the photos aren't quite as good as they're taken with an iPhone (sorry!). Because I adore Rome and Roman food, I'm especially excited about eating here. 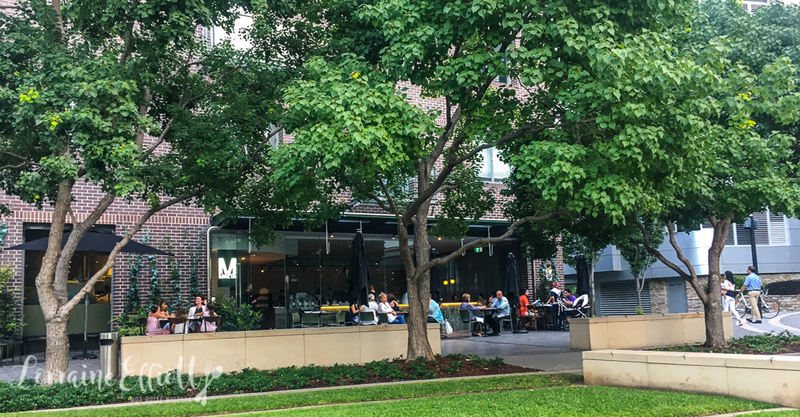 The owner operator is Flavio Carnevale of Popolo who has switched from Southern Italian to Roman cuisine. We order glasses of 2013 Cirelli-Abruzzo trebbiano doc and then immediately order our food because we have so much to catch up on that we just want the food to come and not be interrupted. Alas the Carciofo alla Giudia or deep fried globe artichokes which I loved in Rome's Jewish Quarter are out of season. Our waitress is hurt. Because we haven't gone with all of the things that she has suggested. 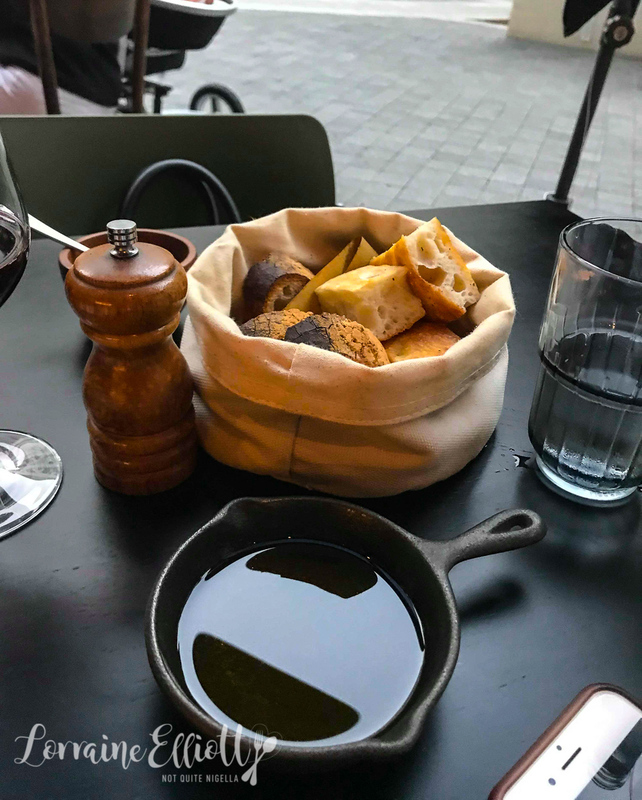 But you see I had already stalked the menu online and earmarked what I wanted and that was of the pasta and bread variety and when she suggests zucchini flowers we both decide their omnipresence makes them less appealing. "How about some greens?" she then suggests and we look at each other shaking our heads in tandem. "Yeah...no," we answer simultaneously. Bring on the carbs! My Italian is terrible so I think I'm ordering gnoccho fritto - that amazing dish from Emilia Romagna with square pillows of deep fried pizza dough draped in prosciutto. 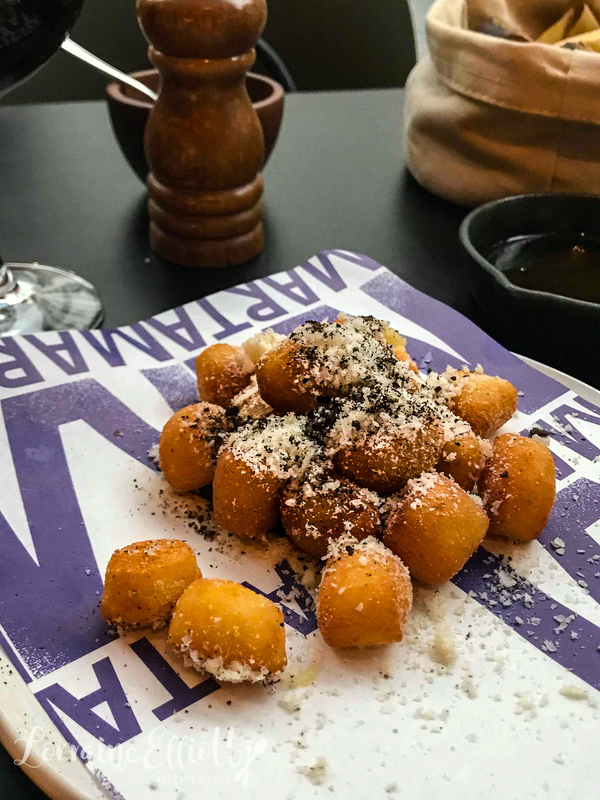 But this is gnocchi fritto, that is balls of deep fried potato gnocchi showered with grated pecorino and black pepper. It's that wonderful combination of rich cheese and pepper. In Rome they use guanciale over pancetta and Pecorino cheese over Reggiano. 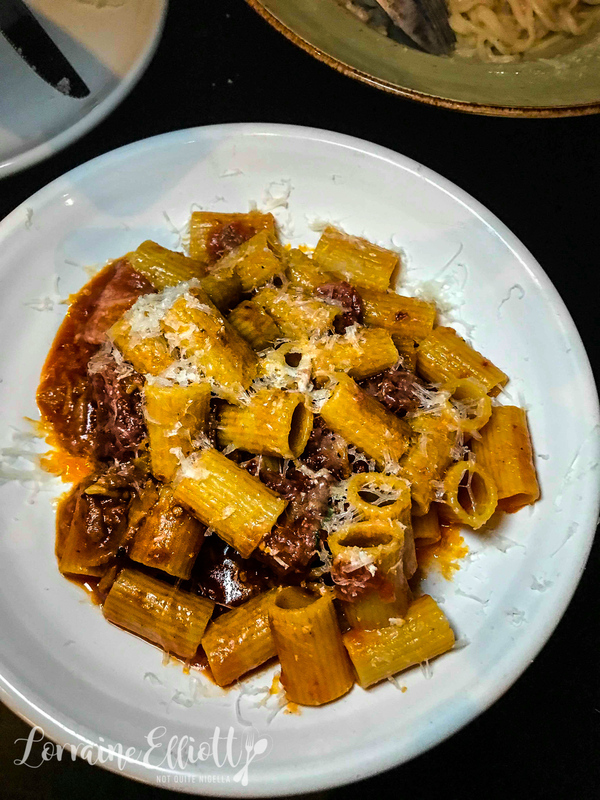 There are four classic and simple Roman pasta dishes and these are: Gricia (guanciale and pecorino), Cacio e Pepe (pecorino and black pepper), Carbonara (eggs, pecorino and guanciale), and Amatriciana (guanciale, chilli and tomato). Cacio e pepe is the simplest to make in an emptyish pantry scenario and it is a divine but simple concoction made with grated pecorino cheese and black pepper. The pasta is Tonnarelli, a square shaped long pasta although this can be hard to find in Australia (I usually sub it with spaghetti which is probably sacrilege, see this recipe here.At Marta they use house made tonnarelli and they mix it at the table (not that necessary a gesture to be honest). It's nice to get a fix of it but the tonnarelli is quite soft in texture and I prefer pasta and noodles to be a bit of firmness. We both loved the Bombolotti with the Roman Amatriciana sauce with perfectly al dente short tube pasta, guanciale, tomato, pepper, chilli and pecorino that is lightly spicy. I go crazy for dishes with guanciale (oh my kingdom for guanciale!). The key to this dish is the perfectly textured pasta and that utterly lickable sauce. I mop up the sauce with a square of focaccia. The menu has a whole section for Schiacciate flatbreads that resembles pizza but they explain that it's Pinza, not pizza. Pinza is crispier than pizza and is made using a technique dating back to the Roman empire where a dough is rested for 72 hours, made with less oil and more water to aid in digestion. 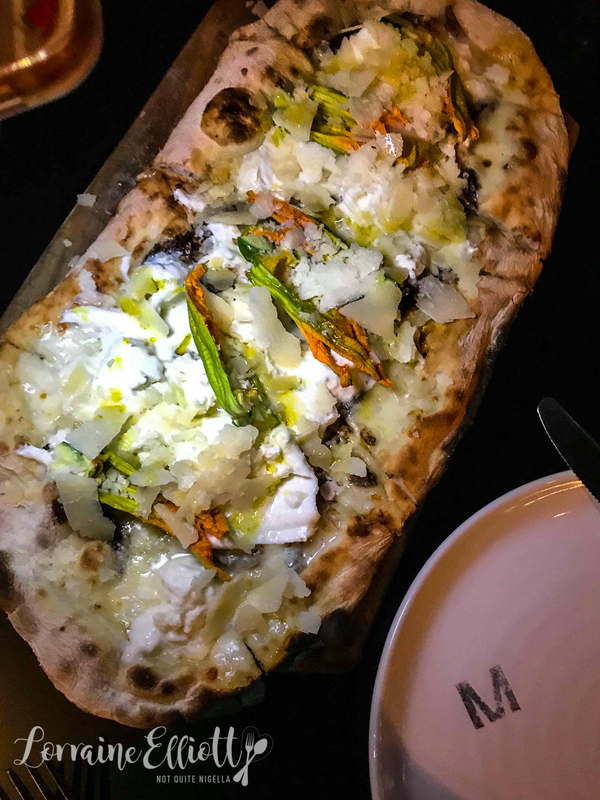 The one that our waitress recommended for us is topped with buffalo mozzarella, zucchini flowers, anchovies and grana padano. It's quite good although the brown anchovies do provide very salty bites when you hit one. "I'm so full I'm going to burst," declares Kristie right before we agree to try two desserts because what is life without dessert? 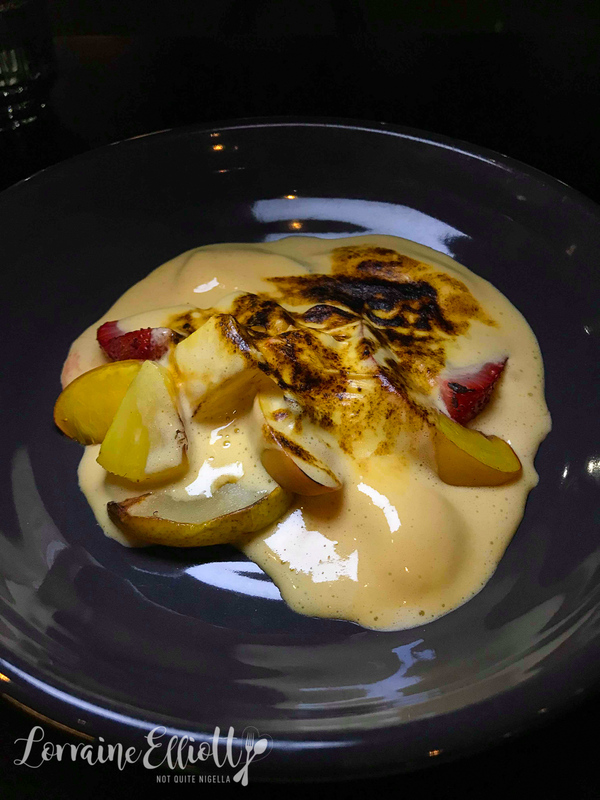 The zabaglione has seasonal fruit like white peaches, pear and strawberries and they are blanketed in a burnt marsala zabaglione. "I hate fruit in desserts," says Kristie searching for some cake or chocolate underneath the lightly scorched top but then she hits a strawberry and turns on a dime. "This is the best," she declares. 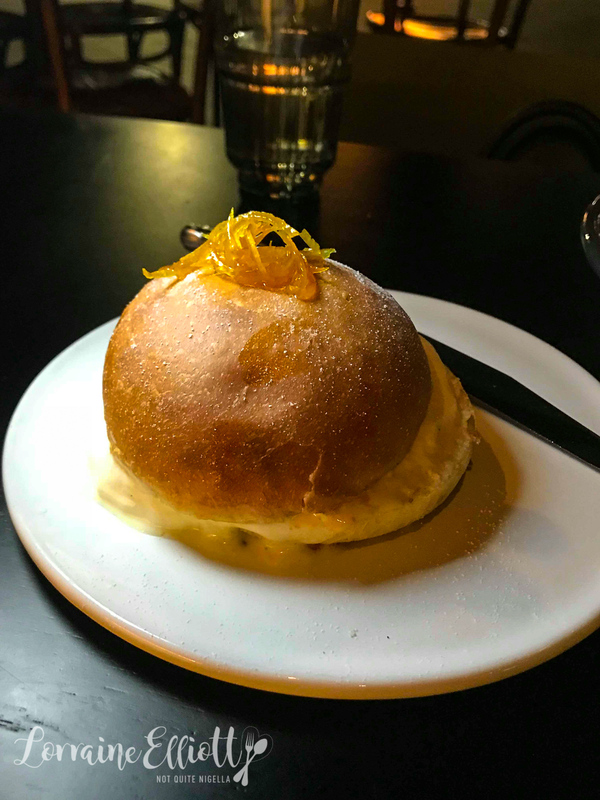 The sweet bun is like a brioche with finely shredded candied orange on top. It's filled with whipped cream and presented with a knife. "I don't even know how to tackle this," says Kristie and I have to agree. Cutting it would surely make all the cream spill out the sides on this very warm Summer's evening. "I think you should pick it up and eat it like a burger," I suggest. It's a sweet bun stuffed with cream and it is satisfying in the way that only an onslaught of carbs after a week of punishing fitness puritanism can be. So tell me Dear Reader, have you ever ordered quickly so that you aren't interrupted because you're too busy talking? And how would you have eaten the whipped cream bun? And do you like fruit in desserts?